Formulated without sulfates, Volume Shampoo Cattier to the light and delicate texture, adds volume to your hair from the roots to a capillary mass denser than ever! Thanks to the complex action of the volumizing Abyssinue Oil and Bio Phytosterols, finished dishes and fine hair lacking volume! With Cattier Organic Shampoo Special issue, it will be sheathed and restructure your hair for a volume effect. Your hair is thicker, more flexible and air! Denser hair with Bio Volumizing Shampoo Cattier! 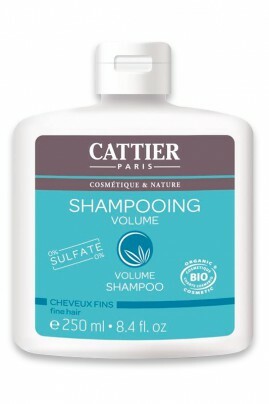 Apply Cattier Volume Shampoo to wet hair, lather all your hair to distribute from roots to ends. Rinse with warm water. For efficiency, use the Volume Conditioner Care Cattier to strengthen and densify the material of your hair. 0% de sulfate, le Shampooing Volume Cattier densifie la masse capillaire de votre chevelure ! Aqua, Sodium Cocoamphoacetate, Decyl Glucoside, Glycerin, Crambe Abyssinica Seed Oil, Phytosterol Esters, Citric Acid, Parfum, Cyperus Esculentus Root Oil*, Aloe Barbadensis Leaf, Extract*, Isoamyl Laurate, PCA Glyceryl Oleate, Xanthan Gum, Benzyl Alcohol, Sodium, Benzoate, Citronellol, Limonene, Linalool.